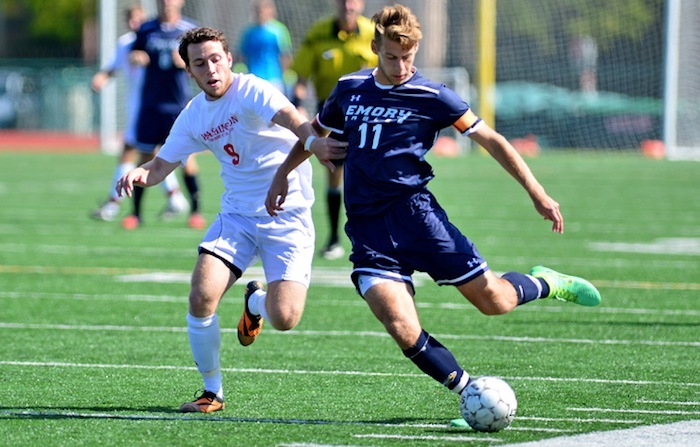 This past Sunday, Oct. 5, the sixth-ranked Emory men’s soccer team began their conference play with an overtime win against their University Athletic Association (UAA) rival, Washington University (Mo.). The game started with the Eagles playing aggressively, when junior forward Sebastian Hardington headed the ball into position within the first six minutes, but Washington’s goalkeeper, Daniel Geanon, was able to cleanly save it. Washington would break the 0-0 tie quickly after the second half started. The Bears’ sophomore midfielder Jack West was taken down to the near side of the 18-yard box in the 57th minute and was able to score the penalty kick, resulting in Washington’s 1-0 lead. The Eagles began to show pressure after the Bears’ goal, and were able to equalize the score in the 63rd minute when senior defender Jeffrey Cochran’s long throw-in landing in the middle of the 18-yard box and senior defender Carl Credle rushed into the area and headed the ball straight into the net. In the 78th minute of the match, Emory had a chance to take the lead when a well-positioned corner kick by sophomore midfielder Eli Curtin placed the ball in the perfect position for Hardington to head the ball in, but Washington’s goalkeeper was right there to deflect it. “We didn’t feel like we played our best in today’s game, but we didn’t put our heads down when we went behind, and we fought back together and worked hard to get a result,” Hardington said. The 1-1 tie led the game into overtime, with Emory attacking aggressively. In the 93rd minute, the Bears’ defense blocked Cochran’s throw in. However, with the ball remaining in the box, junior defender Matt Sherr was able to break the tiebreaker. “It was a good win and really set the tone for the rest of the UAA games,” sophomore midfielder Scott Haley said. Emory played an overall successful game to set the pace for their conference season, outnumbering Washington in shots, 10-8, and shots on goal, 5-3. Emory goalkeeper, junior Abe Hannigan, saved two shots during the game, helping secure the win. This win marks the second-straight overtime win for Emory. It also marks the Eagles’ second longest single-season winning streak in history, with 11 straight wins this season. The squad has 14 straight wins counting the end of last season, signifying their third longest undefeated stretch in the history of the program. With the season record now at 11-0-1, Emory has moved into a three-way tie on top of the UAA standing with fourth-ranked Brandeis University (Mass.) and New York University, each of which won their conference-opening games, too. The Eagles have been the only team in the UAA to win a road game thus far. Now that Emory is in full swing with conference play, the Eagles will return on Saturday, Oct. 11 at 11 a.m., matched against the University of Chicago at the Woodruff Physical Education Center (WoodPEC).